Contractor studies have proven the labor savings of a wireless remote! An average of 20 minutes per job is spent unwinding, positioning, and rewinding the remote cord on a job-site. (more if cord is tangled). Consider the inconvenience of being attached to a cord while crawling thru the attic with the abusive wear and tear on the cord. Our unit operates in the toughest environments and with remote “finder” technology, you’ll never have to worry about losing your hand pendant again. ROI (return on investment) is typically a few months or less. How can you not afford to upgrade your system? So…“cut the cord” and create a SAFER and more EFFICIENT workplace!!! 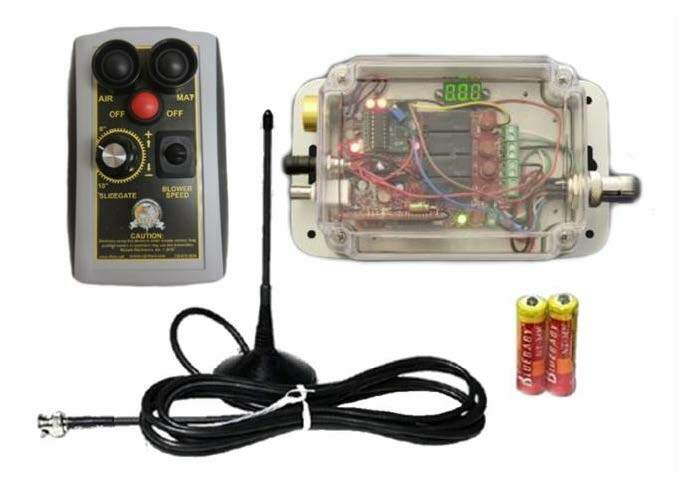 Your new transmitter (hand-held pendant with (3) button control) is equipped with a Remote “Finder” feature. (like the ping from a ‘black box’ on a commercial airliner) Ever lose a remote transmitter in the loose fiber in attic? Once activated, our transmitter emits a series of beeps every minute after 60 minutes of inactivity. This series of beeps continues for approximately 24 hours until activated again, allowing ample time to find this valuable piece of equipment. When your job is finished, our transmitter unit can be placed in ‘sleep’ mode to save battery life. Antenna: Magnetic mount antenna with 15ft of cable. Receiver: Pre-wired for plug-in to Cool Machines systems. Transmitter: Hand-held controller (transmitter) with 3-button function. Batteries: (2) AA NiMH rechargeable batteries and charger. Extended Remote: Plugs into auxiliary outlet. Full ‘Command & Control’… All in One Hand! Say hello to your new little friend! 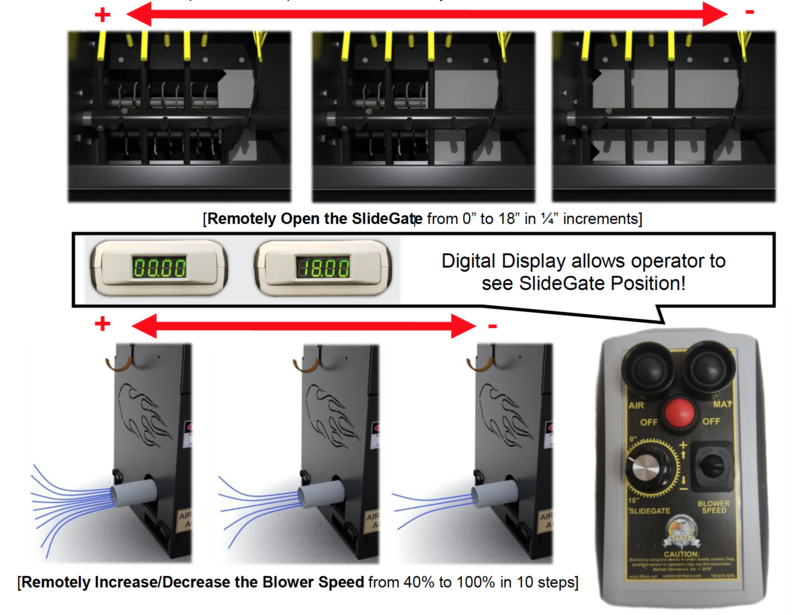 Our new Variable Speed Remote (VSR) with variable SlideGate and Blower Controls! Provides (Command) ability to change machine settings, and (Control) on/off of machine from the output end of the hose! Q. Want more fiber but don’t want to leave the attic…? A. Just turn the SlideGate dial to desired digital setting and ‘Presto’! Q. Want your blower(s) turned up for more air…? A. Just click up/down ‘Blower Speed’ switch and ‘Presto’! As with our other remotes, this Cool unit is equipped with a Remote “Finder” feature (like the ping from a ‘black box’ on a commercial airliner)…giving you the same 24 hours to find that lost remote! When your job is finished, our transmitter unit can be placed in ‘sleep’ mode to save battery life.